Canadian PM Stephen Harper has pledged to “strongly oppose” Russia rejoining the Group of Seven nations as long as Vladimir Putin is president. The G7 suspended Moscow last year over the conflict in Ukraine, but hasn't ruled out allowing it back. "I don't think Russia under Vladimir Putin belongs in the G7. Period," Harper said in an exclusive interview with AP ahead of his trip to Ukraine and the G7 meeting in Bavaria this week. "Canada would very, very strongly oppose Putin ever sitting around that table again. It would require consensus to bring Russia back and that consensus will just not happen." According to Harper, who faces re-election in October, Moscow is hard to get on with. "Russia is more often than not trying deliberately to be a strategic rival, to deliberately counter the good things we're trying to achieve in the world than for no other reason than to just counter them," Harper said, adding that the "mindset of the guy we are dealing with is that the Cold War has never ended and, `I've got to fight to change the ending somehow.'" 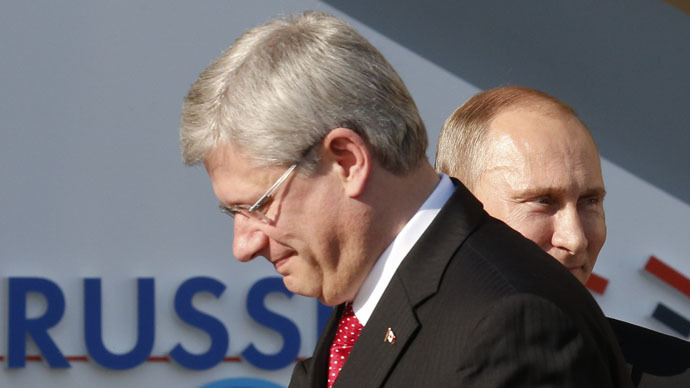 "I don't think there is any way under this leader Russia will ever change," Harper said. Last year's summer summit of the world's leading industrialized nations was the first in 17 years without Russia. It was due to have taken place in the Russian Black Sea resort of Sochi. The meeting was called off after Crimea reunited with Russia following a referendum – a move deemed by leading Western nations as an “illegal annexation” of territory. President Barack Obama, who will join the leaders of Britain, Germany, France, Italy, Canada and Japan at the upcoming G7 summit in Germany, plans to urge European allies to continue with sanctions against Russia. White House officials said they are concerned by the outburst of violence in Ukraine earlier this week. Kiev forces shelled the eastern Ukrainian city of Donetsk on Wednesday, mostly the southwest Petrovsky and Kirovsky districts, killing at least six people and injuring 90 others. The RT crew, who were among the first reporters at the scene, recorded dramatic footage of the shelling’s aftermath. Moscow says Kiev has breached the Minsk deal. According to Kremlin spokesman Dmitry Peskov, the timing of the new tensions is connected with the upcoming EU summit, which is to take place in Brussels on June 25-26. US State Department spokesperson Marie Harf has refused to acknowledge that the Kiev authorities are violating the Minsk peace agreements, however, ignoring daily OSCE reports that equally implicate the government and the rebel forces. “Behind the formally-declared aim to make us alter our position toward Ukraine, [we] see the [US] plan to form the social and economic conditions to change the leadership in Russia,” said Russian Deputy Foreign Minister Sergey Ryabkov. According to Ryabkov, first of all Western countries wanted “to punish” Russia for “free will of people in Crimea and [the city of] Sevastopol,” who in a March referendum decided to separate from Ukraine and to join Russia. The Ukraine conflict began last April, when Kiev sent regular forces and volunteer battalions to the southeastern Donetsk and Lugansk Regions, after rebels there refused to recognize the country’s coup-imposed authorities. Despite failing to provide any fact-based proof whatsoever, the West has pointed the finger at Russia for allegedly masterminding the Ukrainian unrest and supporting the rebels in the Donetsk and Lugansk Regions. According to the UN Human Rights Office, at least 6,116 people have been killed and 15,474 wounded during a year of bloody fighting. Since Russia’s reunion with Crimea, NATO forces have stepped up military exercises along the Russian border – in the Baltic States and Eastern Europe. US, Spain, Canada, Romania and Turkey sent their warships to take part in the “Sea Breeze 2014” joint naval exercises with Ukraine in the Black Sea. Moscow responded with an increased number of flights of its long-range “Bear” Tu-95 bombers in the vicinity of the airspace of NATO members, as well as heavyweight drills on own territory. According to the Canadian PM, Russia has significantly stepped up its long-range bomber patrols near North American airspace. A senior Canadian official, who spoke on condition of anonymity, told AP that there were allegedly 52 Russian patrols last year, compared to 23 in each of the previous two years. "This is a country that has shown a willingness to invade its neighbors, to actually seize territory that does not belong to it, and so I don't think we should take this escalation of a hostile military posture lightly. It needs to be treated seriously," Harper said. In 2014, the European Union and the US introduced a range of orders and sanctions in response to Crimea joining Russia and the situation in southeast Ukraine. Russia in its turn banned agricultural imports from sanctioning countries in August. The current restrictions are applied to meat, poultry and fish, cheese, milk, fruit and vegetables from the US, the EU countries, Australia, Canada and Norway. The embargo was introduced for one year, possibly to be prolonged if the situation fails to improve. The Russian prime minister warned EU officials earlier this week that if they decided to tighten the regime of sanctions against Russia, an equivalent reply would follow inevitably. According to European experts, the sanctions cost the West €40 billion last year, including €12 billion is losses by European farmers. Russian Finance Minister Anton Siluanov acknowledged last November that the country is losing about $40 billion a year because of the Western sanctions.